IT'S NEVER TOO LATE TO IMPROVE YOUR VISION! Vision comes to normal and relaxed eyes as effortlessly as... scent to the nostrils, music to the ear or the touch of velvet to the fingertips. In the following you will read about how you can improve or completely return your vision to normal and experience healthy eyes again, whether you are, nearsighted, farsighted, astigmatic, hyperopic, amblyopic, have nystagmus, macular degeneration, glaucoma, strabismus and inflammation, cataract, ptosis (drooping eyelid), bells’ palsy, fibromyalgia, keratoconus, eye fatigue, headaches, dry eyes, light sensitivity or computer eyestrain, Eye-Robics will assist you to clarity and normal healthy eyes free of symptoms of dis-ease. Having worn glasses for ten years, I learned about the Dr. Bates Method of Vision Training from a friend. I didn’t know there was anything one could do about wearing glasses. I never liked them, but was unaware of any alternative until I heard about the Dr. Bates Method. I went through the vision training process of physical therapy for the eyes, normalized my vision and went on to become a teacher of the method. I have coined the term Eye-Robics because that is exactly what physical therapy is, getting the eyes into motion, to function and into its’ natural normal flexible state. There are several things you should know about Eye-Robics Vision Training. One is that if your eyes can get worse (not seeing clearly) they can get better (see clearly again). This is what Dr. Bates discovered over 90 year ago. He asked,”If glasses are correct why do they continually need to be strengthened, while the eyes under their influence have been weakened?” Glasses are a crutch, and not intended to be used for a lifetime. As with all crutches, their purpose is to allow you to function (see to drive etc.) until your own muscles are strengthened and you no longer need the crutch. We do this in Eye-Robics vision training. If a person has a strong prescription we have them wear a weaker prescription (safe for driving) for where ever they are visually. This allows the eyes to function more under the lens and allows continued progress in getting healthier and clearer vision; you treat your glasses like a pair of crutches, using them when you need to see for safety etc. and leaving them off other times to allow the eyes to loosen up and function. As the vision improves, a lesser prescription is needed and the person goes into a healthy spiral of weaker and weaker glasses until none are needed. The number of prescription changes varies with the persons need for clarity in their profession and the strength of the prescription. Someone with a mild prescription may never need a weaker prescription. A strong prescription may need two or three changes. There is a way to keep your eyes healthy and fit, even if you have glaucoma, or cataracts along with whatever reason you originally went into glasses, such as myopia (nearsighted-ness), presbyopia (farsightedness), astigmatism or any other eye problem. This brings us to the second thing you need to know. What does it mean to have healthy eyes? If your vision is 20/20 and the demands on your eyes are not causing you physical strain and discomfort in your eyes, head, neck and back, then you have healthy eyes. If you are not seeing clearly and experience getting stronger and stronger lenses every year or two, have glaucoma, cataracts, astigmatism or any other eye problems then you need to consider a healthier alternative. If you look around you and in care homes, you will find that the “Golden Years” are not so “Golden”. So many older people have glaucoma, cataracts, macular degeneration, ptosis (drooping eyelid), etc. Most all of these conditions are a result of stress which causes lack of functioning and circulation over time. This condition (lack of circulation) over a period of time causes deterioration. The medical profession calls it old age, but eyes can learn how to be healthier and function for a lifetime. The third thing you need to know is the cause and the cure of vision problems. Dr. Wm. H. Bates, ophthalmologist, pioneered vision therapy in the early1900's; he discovered the cause and the cure of vision problems. He discovered that tension in the mind interfered with the involuntary focusing muscles of the eye. In the normal eye whether you look near or far, the eye automatically focuses where you put your attention. This is called eye-mind coordination. We see with our mind first directing our attention. Vision is 9/10 mental and 1/10 physical. The eyes are tools of the mind. Just as ulcers and heart attacks are caused by prolonged stress (psycho somatic illness), so is the vision affected by stress. These stresses are always accompanied by changes: people moving, changing schools, a divorce, a death, career changes, a difficult relationship. These changes create stress and an element of the unknown which evokes fear. This fear is usually repressed as a survival mechanism and never dealt with again. As opposed to a medical or mechanical approach, this vision training is based on the principle of relaxation. It teaches specific techniques and skills for relaxing mental stress, releasing muscle tension and restoring muscle flexibility. It releases the strain that keeps you from seeing clearly and re-educates the mind and body in good seeing habits. You may say, "How can Eye-Robics work with all eye problems?" It works with all eye problems because it works with the cause, not the symptoms as wearing glasses, contacts or having surgery. You release the cause and allow the body to do its own healing as it was intended to do. We are made in the image of our creator, God. The word disease if broken down can be said another way, dis---ease, not at ease with our self. Eye-Robics allows awareness to unfold as well. I have developed "The Rapid Healing Technique" for my students to assist them in dealing with emotions as they come up in this process on the road back to clairity. This e-book is offered as a bonus when you purchase the Eye-Robics program. Click on "The Rapid Healing Technique" for more details. Eye-Robics is easy, safe, fun and it’s for everyone, regardless of age or strength of glasses (prescription). The Dr. Bates Method which I call Eye-Robics is physical therapy for the eyes. The process allows the muscles to return to functioning and therefore a healthy state allowing good circulation. Healthy eyes do not have eye diseases. Check out which of the four programs is for you: Eye-robics hard copy; E-Book; Eye-Robics for Infants and Small Children and Expand Your Eye-Q Workshop. Online teacher certification course is available to qualified persons. IMPROVE THE HEALTH OF YOUR EYES! The only thing you have to lose is your poor eyesight. This could be the best investment you will ever make for your eye health. Take your eye health into you own hands. What you have to gain is healthy eyes for a lifetime and the way to keep them healthy. The eye care field does not have any suggestions for you. It is only when you have a problem that they attempt to fix it. Prevention is not in their vocabulary. Invest in your eye health! For a limited time only, if you order now you will receive an Additional bonus of "The Rapid Healing Technique E-Book“ and free shipping in the U.S. UNCONDITIONAL MONEY BACK GUARANTEE ON THE EYE-ROBICS PROGRAM Vision Training Institute LLC offers a risk free unconditional sixty day money back guarantee on the hard copy and e-program. If for any reason you are not completely satisfied, notify us within sixty days. We will promptly refund your money less postage after receiving the materials in good condition. All hard copy books and e-programs 60 day unconditional money back guarantee. Four years ago (1990), I noticed I had a seeing problem and visited my eye doctor. At this time he advised me that I had macular degeneration that would not respond to any known medical treatment and while I would never experience total blindness I would eventually lose the ability to read and drive a car. Two years later (1992) it became more evident that my right eye was changing. A second doctor visitation was made with no encouragement. There was a change in glasses as well. In 1994 I started lessons with Dr. Taber and after four months I went to my doctor again and he asked me if I had taken any nutrients, my macular degeneration had stabilized and that I didn't need new glasses. I am happy to say that I did get a very valid drivers’ license for four years..I am able to walk more securely and my ability to read is so much improved. I have more gain to make, but I will continue these valuable and enjoyable drills and techniques forever. This woman was farsighted as well as being dyslexic since early childhood. She had difficulty with reading as long as she could remember. Reading was a struggle and as an older adult not being able to see the print with out glasses was very disturbing to her. In a matter of a few weeks she overcame the dyslexcia. As I worked with her she became very aware of events that had occured in her childhood and the learning process. She released the emotional stress that had caused her to become dyslexic and normalized her vision to 20/20 near and far. (see more video successes for her experience in her own words). This woman was born with rheumatoid arthritis and had cataract, glaucoma that would not respond to medication and strabismus and inflammation (lazy eye) that had not functioned for some time. Within a few weeks her eye pressure was down to normal and within a few more weeks she was able to read and her non functioning eye straightened out and she improved her ability to see near and far (see the video) Violet. This 66 year old man came to me because he had had a hemorrhage in his left eye. Previous laser treatment from an ophthalmologist resulted in further damage. As a last resort he took vision training. He had worn glasses for 25 years and bifocals the last five years. A diagnose of macular degeneration was also noted at this time. He had a very tense personality, was restless, and hadn't slept through the night in over ten years. Prior to starting training his vision measurement for reading was R = 20/150, L = the eye with hemorrhage could only see black and shades of gray of large print (Reader's Digest large print magazine) at 20 inches. For distance his vision was R = 20/25, L= his left eye could not distinguish a two inch letter at three feet because of the damage. After six lessons he learned to see better and began sleeping through the night. He could now see with his left eye a two- inch letter at eight feet. He reported elaxed sleeping throughout the night. Friends commented on how calm he had become. After ten lessons he was so grateful to have his vision returning and felt so good he even decided not to sue the ophthalmologist for malpractice. It bears repeating, it doesn't seem to matter how severe the vision problem is, motivation seems to move mountains. I feel more relaxed than I have in many years. I had almost forgotten how wonderful it is to feel good. The lessons are really fun and I love seeing clearly again. You cannot imagine the thrill of seeing clearly once again. It's exhilarating! In just 10 weeks of doing the Eye-Robics program, my eyes are back to normal. I can read menus and small print again without glasses. Thank you for offering such a wonderful program. Besides significantly improving my vision, after only six weeks, I no longer feel the need for sunglasses. For as long as I can remember I have been uncomfortable in the sun, squinting etc. Also I no longer experience having headaches which have plagued me regularly in the past. I cannot thank you enough for the Eye-Robics program. I have had high blood pressure for almost two years. The doctor wanted me to take a stress class. I decided to take the Eye-Robics program instead. After ten days I had my first normal blood pressure reading. I also love seeing clearly again! I have been a teacher for most of my life as an adult. I have learned to have an open mind to new ideas and concepts. I got to the point in my life that I would have been forced to wear glasses. Since I had never worn them before, I wasn’t excited about the idea. When I heard about you, the Vision Training Institute, and the Eye-Robics program I had to find out more. I didn’t know there was an alternative to glasses or contacts. I am so glad that I took the Eye-Robics vision training program instead of buying glasses. The resulting relaxation is incredible. When my eyes are relaxed I have more energy. Blurred vision zapped my energy. If I hadn’t taken the Eye-Robics vision training program I would be wearing glasses now. This is the best thing I ever did for my vision. Now I understand how stress can affect the way I see and feel. Thank You! Two months ago an ophthalmologist told me if I didn’t have lazer surgery on my retinas I might lose the vision of one eye. 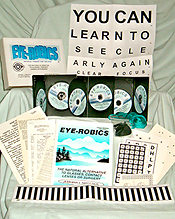 I began lessons at the Vision Training Institute with Dr. Jerriann Taber doing the Eye=Robics program. She worked with me twice a week, while I did the exercises daily at home. I returned to the ophthalmologist last week for a second examination. He reported that my retinas were much, much better” and I did not need the surgery. Two years ago Dr. Taber helped me arrest cataracts. She uses the long proven Dr. Bates Method of Vision Training, called “Eye-Robics”. I recommend the Vision Training Institute, the Eye-Robics program and her highly. She is a lovely woman, devoted to saving and improving eyesight. Fuchs’ Dystrophy (clouding of cornea), Cataracts, Macular Degeneration, plus a hole in the right retina, repaired by surgery, Ptosis (droopy eye lid) and Bells Palsy. I want to write and thank you for the Eye-Robics eye exercises. I started on them last August and to give a brief background on my vision problems, will start with the diagnose of Fuchs’ Dystrophy (clouding of cornea), Cataracts, Macular Degeneration, plus a hole in the right retina, repaired by surgery and Bells Palsy. When I started the program I could scarcely see the first line eight feet away with my right eye that had a cornea transplant and cataract lens implant. My corrective lens gave me 20/70 and my doctor indicated that he didn’t think I was going to improve much. The left eye was not so bad. And the correction for that eye was 20/40. which make it still legal for me to drive but I might add, with much difficulty. I stated the eye exercises in August with a lot of commitment and determination. By September the right eye was better to 20/50 and the left eye tested to be 20/30 (with corrective lenses). I had a quick examination a short time ago and the doctor said he didn’t think I would have any problem in passing the eye exam when my license is due in May. He thinks he can give me a better correction than I had before, so look forward to that. This is very important to me as I live alone and want to maintain my independence as long as is possible. I am 67 and I have hopes for several good years ahead. To get back to the vision---when I started the left eye was barely able to read the second line from 20 feet. With both eyes I could see the third line from 20 feet (barely). Now I can read the third line (very blurry) with the right eye at about eight feet; the left eye, the fourth line at 20 feet and both eyes at 20 feet. Granted this is blurred, but so much better than when I started. I am encouraged. With my glasses I now see 20/25 according to your chart. Since I started the program I have not missed very many days with the drills and doing chart work three days a week. I am very thankful to and to God for this program. You told me on the phone when I was talking to you to have faith and I know that this is very important. Many people have been praying for me and I know God answers prayers. Thank you again for helping me regain vision and hope. Two side benefits have been better sleep and the right eye lid that was droopy is now much improved. After talking to you on the phone about the Bells palsy symptoms and you telling me what to do specifically, almost all the symptoms are gone and my vision is coming back. I apologize for this probably being hard to read. My close up vision is not the best either but can see well enough without glasses for most things. At one time I could not have written this at all.